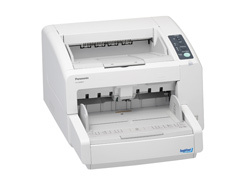 The KV-S4085CL/CW are high speed colour scanners that incorporate Panasonic’s ToughFeed innovative paper feed mechanism. Panasonic’s ToughFeed offers exceptional features and performances for a powerful, robust scanning solution. These high-speed scanners offer straight pass or long paper scanning. High duty cycle of up to, 30,000 pages/day will not disappoint in today’s demanding office.